Although this has been a very busy week, I did get the chance to work on "Project 2", from my list of personal projects. This is my second piece inspired by Pattern Magic: Stretch Fabrics (affiliate ad link) by Tomoko Nakamichi. Instead of using the sloper provided in her book, I'm using my personal pattern block and drafting the new pattern from that. Because I have my pattern blocks in digital form, I decided to use Inkscape to do all the slash and turn. This is what I have so far. I'm sure that if you're not familiar with any of Nakamichi's Pattern Magic books, this looks pretty strange. This is the entire front that should be cut in one piece out of the garment fabric. 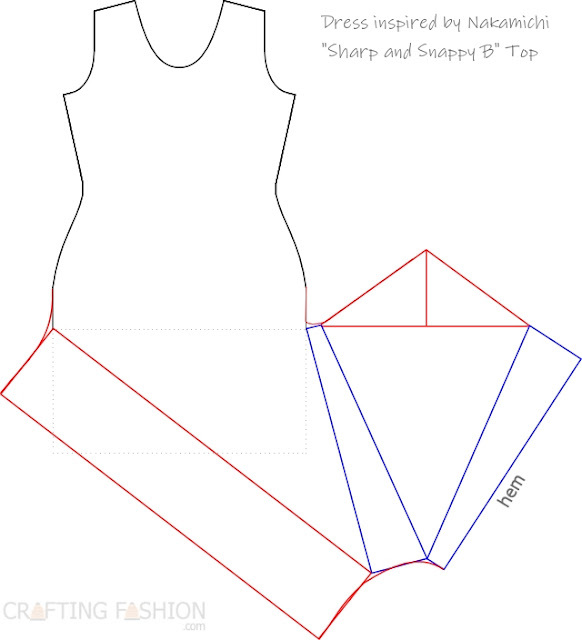 The blue quadrilaterals were part of the original standard dress shape. I slashed and rotated them following Nakamichi's instructions. The red shapes and lines were drawn in the next step. The back will match the front exactly on the bottom. And by the way, I do like Inkscape for this type of pattern drafting. I'm very excited about the fabric I've decided on. Unfortunately, this fabric is still in my imagination, so I'm unable to show a photo yet. It will be a plain jersey (maybe reverse jersey) bamboo, mixed yarns with a cream, gold colorway. 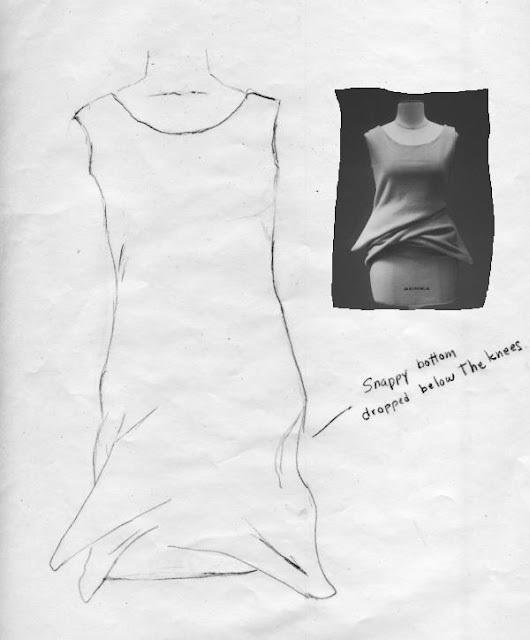 I want some type of horizontal patterning so that the stripes become "disturbed" at the bottom of the dress. I've decided to do the patterning with color as opposed to texture. I imagine the knit fabric to look something like this. My schedule doesn't permit me to return to this project for a little while, so I'll just keep imagining for now.